Pro-Ject Juke Box review | What Hi-Fi? Pro-ject's Juke Box harks back to the music centres of the '70s and '80s. It's a record player, phono stage and amplifier in one, requiring only a pair of speakers to make a complete system. 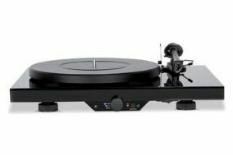 Buy the bits individually – the Juke Box is a combination of a Debut III turntable, Speed Box II controller, Phono Box II phono stage and a Stereo Box amp – and you'd end up paying £270 more. Build quality is decent enough: generally the Juke Box feels well made, although a wobbly volume control lets things down a little. Those familiar with the Debut will feel right at home setting up this product. The procedure is the same, and pretty easy to do. The rest of this unit is simple to use, aided by the functional remote. In use, this Pro-ject is a decent performer. As far as we can tell, the record-playing part sounds much like a standard Debut. There's all the cohesion, insight and musicality we'd expect from the budget classic. We say as far as we can tell, because it's only possible to listen to the record player via the in-built amplifier, and judging by the performance of its line-level inputs, the amp is better than average. The Juke Box will go louder than you might expect, given the claimed output of 20W per channel. Tonally the amp is even, and there's a fair amount of detail on offer. Where it falls short is a lack of subtlety and transparency. The whole thing sounds more cluttered than it should. But we don't want to end on a downer. We love the Juke Box idea and it works well as a space-saving concept. Just don't expect to get separates levels of performance.